This book is designed to show how to create specialized instruction based on the individualized needs of students with emotional and behavioral disorders. 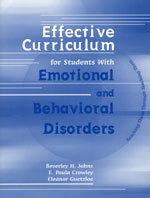 The book demonstrates throughout how to plan a curriculum based on a diagnostic prescriptive approach. The authors stress that teachers must know as much as possible about each student. This includes strengths, deficits, interests, and behavioral functions. Teachers can then plan an appropriate program based on effective, direct instructional approaches.